three wheels and seven weeks to go. – british. foodie. dreamer. Well Nottingham, I’ve seen it all! This makes Nottingham seem really dodgy but I promise you all it isn’t. I’ve never really felt unsafe or at peril during my time here and I just couldn’t believe my luck. Of course my brain immediately thought: “what does this all mean? !”… “Is this the bad thing that happens just because I’m happy? Is there a chance that I’m never meant to have a week of just normal life?” Even though ‘normal’ is pretty difficult to define, I can definitely say that my life is not boring! Dave’s small hope that I had spent the evening before casually taking my wheel off my car amused me greatly. 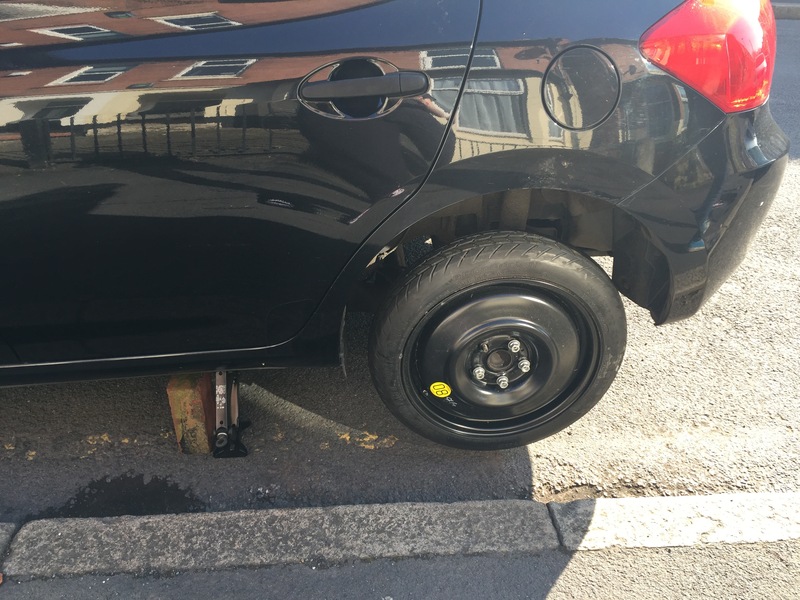 I don’t know who or why this person has taken my wheel – maybe there’s a shortage in the Lenton area? I have to admit I’ve never checked my car to see if I have a spare tyre so it was a great relief to see I do! Clare and I battled to get the car jack out of its compartment but once Dave came back from the gym we managed it. My friend Jo came over to help in any way she could – a saviour – and partly wanted to put off going to the dreaded Hallward Library (hehe). We managed to put the spare although I thought we had no knuts and bolts then ended up finding some…. but only having four out of five. Oh well! Once screwed on we went on a short adventure to Mr. Tyre five minutes away (and hoped that the wheel could survive missing one bolt (logic dictates yes?). And that is where my car is currently sat. I’m feeling pretty grateful for all the friends I’ve made here at Notts. I had a moment the other day where I didn’t think I’d be who I am nor have the friendships I do with the majority of the people in my life. It’s been incredible to watch all of us change, my housemates, my course-mates and everyone else along the way. I felt like a black sheep in a white herd for some parts of first year. I guess it is easy to think that. I am starting to get a little emotional at the idea that it’s all going to change, that this “notts life” chapter is close to the end but, as most people would say, I wouldn’t change it for anything. Over the various struggles over homework, coursework, future plans, what we’re gonna eat for dinner, our love life woes and all the daily adventures… we’ve come out okay! Posted on April 13, 2016 by GeorgiePosted in Final (4th) Undergraduate YearTagged alifeofalanguagestudent, cartroubles, finalyear, friends, Lastest Adventures, lovinglife, studentlife.